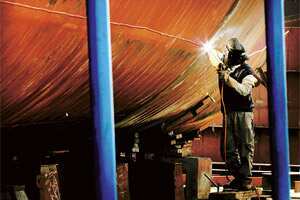 Maritime business: A shipwright welds a steel hull plate. According to the Shipyards Association of India, shipbuilding will entail an investment of about Rs2.22 trillion by 2017. Mumbai: Mumbai-based Garware Offshore Services Ltd, a company that offers ships for oil and gas exploration activities, plans to enter the shipbuilding business by setting up an exclusive facility for making offshore support vessels. This shipbuilding yard will be a joint venture with Norway-based ship manufacturer Havyard Leirvik AS, promoted by Havyard Group AS. Havyard Leirvik is a leader in making offshore ships, ice-breaking ships and other types of specialized vessels. “This could be a 50:50 joint venture, and the company is considering various sites in Gujarat," said a person familiar with the developments, who did not want to be identified. Garware Offshore vice-chairman and managing director Aditya A. Garware declined to comment. “We have been building ships for Garware. Now we are looking at cementing this relationship through other alternative investment options together. However, nothing has been finalized," said Captain Geir Johan Bakke, president and CEO of Havyard Group. Garware Offshore had recently signed an agreement with Havyard Leirvik for exclusive representation for the marketing and sale of ships built by them and ship designs produced by Havyard Maritime AS to Indian shipping companies and yards. According to Shipyards Association of India, a New Delhi-based platform for shipyards, shipbuilding will entail a total investment of around Rs37,000 crore by 2012, and around Rs2.22 trillion by 2017. The growth triggered by shipbuilding in ancillary and supporting industries will generate an additional income for the government through tax revenues of about Rs4,850 crore in 2012, and approximately Rs26,000 crore in 2017. Leading shipbuilding yards in the country include ABG Shipyard Ltd, Bharati Shipyard Ltd, Larsen & Toubro Ltd, Tebma Engineering Ltd, Cochin Shipyard Ltd, Chowgule & Co. Pvt. Ltd, Dempo Shipbuilding & Engineering Works Ltd and Modest Infrastructure Pvt. Ltd.
Apart from existing players, the?Tata Group, Shipping Corp. of India Ltd, the Jindal Group, Mercator Lines Ltd, Shapoorji Pallonji & Co. Ltd and the Adani Group are also entering the shipbuilding business. The Gujarat state-controlled Gujarat Maritime Board is planning to set up 100 shipyards in 10 industrial clusters in the next five years. “Shipbuilding is the natural progression (for Garware Offshore) to the design marketing relationship with Havyard. Investment and final location would be finalized shortly. However, Gujarat is the preferred choice as the state is offering some concession for shipbuilders," the person said. Garware Offshore has so far sold four designs to ABG Shipyard. “We are in advanced talks with a leading shipyard for selling four more designs that will be followed by another four," said Garware. He said the company has plans to set up a knowledge process outsourcing centre in India in collaboration with Havyard, which will design all types of marine assets. At present, Havyard is building two offshore ships for Garware Offshore.